NEW YORK, NY [GOARCH]. 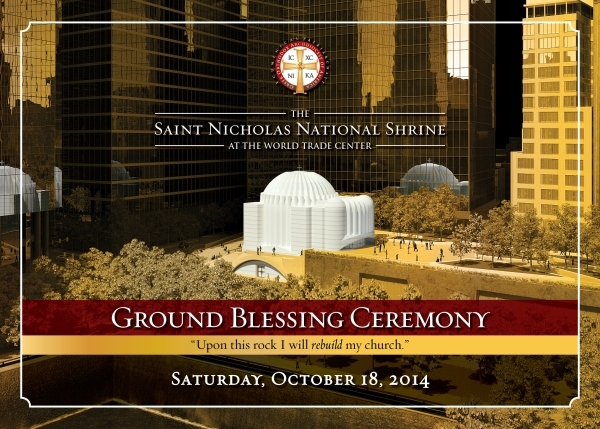 A Ground Blessing ceremony for the Saint Nicholas National Shrine at the World Trade Center here has been set for Saturday, October 18, 2014 at noon. The ceremony will include a combined prayer service of blessing of the site, a Doxology (a service of thanksgiving) and a memorial service for the victims of the terrorist attacks of September 11, 2001. The small Greek Orthodox Church of Saint Nicholas, which was established in 1916, was completely obliterated on September 11, 2001 when the South Tower fell. The new Saint Nicholas National Shrine will be rebuilt only a short distance away at 130 Liberty Street, overlooking the 9/11 Memorial. His Eminence, Archbishop Demetrios of America will preside at the historic event with the participation of the hierarchs of the Holy Eparchial Synod of the Greek Orthodox Archdiocese of America. It will be attended by dignitaries and officials of the City of New York, officials of the States of New York and New Jersey, chaplains and interfaith representatives, family members of victims of 9/11, representatives of Archdiocese institutions and organizations and many faithful Orthodox Christians. Additional details of the event will be forthcoming on the Archdiocese’s web site.